FULTON – The Fulton Art Association presented two art scholarships at the commencement ceremony on June 28 at G. Ray Bodley High School in Fulton. The two $100 scholarships were bestowed upon graduating seniors Jack Ryan and Seth Rogers-Miller, who have each displayed special artistic talent. Two seniors who graduated from G. Ray Bodley High School in Fulton last Saturday each received a $100 scholarship from the Fulton Art Association for their artistic talent. 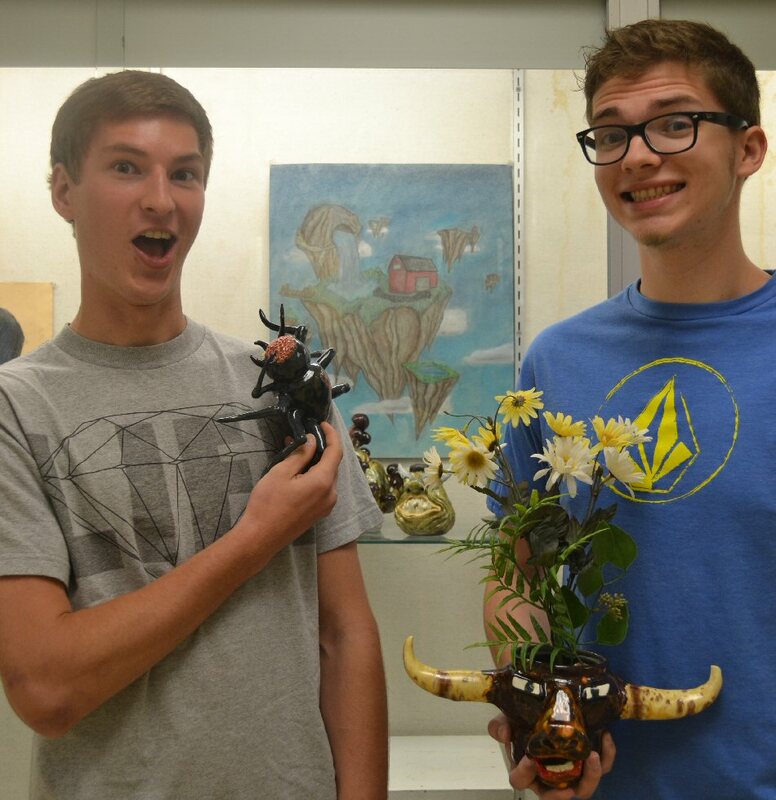 Jack Ryan (left) and Seth Rogers-Miller are pictured with some of their latest ceramic pieces. They were chosen by their teachers, Meredith Gill-Williams and Jackie Tyler. Both of the scholarship winners participated in the Ceramics category at the 2014 High School Invitational Art and Photography Show held in March and sponsored by the Fulton Art Association, according to FAA President Kathy Mihalek. Ryan is the son of Patrick and Tracey Ryan of Fulton, and Rogers-Miller is the son of Faith Rogers and William Miller Jr. of Fulton. For more information about the FAA, call 315-532-3803.